Women In Retail Leadership Circle | A Girl’s Night Out You Can’t Miss! A Girl’s Night Out You Can’t Miss! It’s official: The stage is set for the Women in Retail Leadership Circle’s “Girl Talks” events, taking place in New York City on Oct. 13 and San Francisco on Oct. 27! At Girl Talks, women retail executives gather with their peers to hear short, passionate presentations (each lasting 15 minutes, with five minutes for audience questions) delivered by powerful women leaders. We’re sure you’ll be inspired by their personal stories, as well as gain new insights and ideas on critical areas such as leadership skills, emerging retail technology trends, learning from failure, how to negotiate, and so much more! Girl Talks East, which is taking place at the Kitano New York, will feature four dynamic presentations from women leaders at Kate Spade & Co., STORY, Keds, and Time Inc. 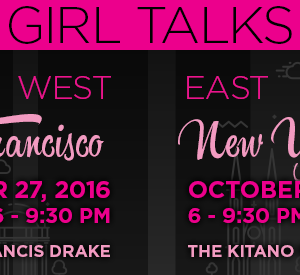 Girl Talks West, taking place at the Sir Francis Drake Hotel, will feature women executives from industry powerhouses, including Williams-Sonoma, True & Co., SharpAlice, and Joyus/theBoardlist. We can’t wait to see you this fall!